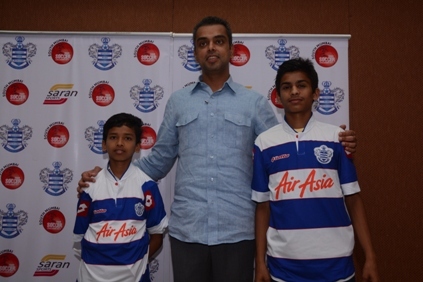 Two talented soccer players and winners of India’s largest community soccer championship – South Mumbai Junior Soccer Challenger 2013, will be heading to the Queens Park Rangers Football Club in London. The winners will be on the front lines of some amazing learning experience in a three week long coaching programme in UK. On the eve of their departure, the organiser of the initiative Milind Deora, Minister of State for Communications, IT and Shipping felicitated the winners in Mumbai. Commenting on the occasion, Milind Deora said, “The south Mumbai soccer championship has attempted to build a social rainbow of participants coming from varied backgrounds under one banner. In the last five years, the professionally conducted game has honed talent and seen participation from over 17000 students interested in football.